What does the temperature warning light mean? High engine temperatures can lead to overheating and irreversible engine damage. For this reason, cars use advanced cooling systems to regulate engine temperature and prevent overheating from occurring. The temperature warning light is a dashboard light which illuminates when your engine is running hotter than it should be. This usually happens due to a problem with your car’s cooling system. Many cars have a temperature gauge as well as a warning light. If you notice that the light has come on, check the temperature gauge to see if your engine is reaching a high level. If you notice the temperature light on, you should stop driving when you can. As the engine reaches high temperatures, various parts can warp, seize, burn or sustain serious damage. This can result in your car needing an expensive engine repair or engine replacement. Pulling over to the side of the road and having your car towed may be inconvenient, but it can save you from a very expensive repair bill. Coolant due for replacement – Coolant is what absorbs heat from the engine and keeps it at a healthy temperature. It is important to remember that coolant doesn’t keep its cooling properties forever and that it should be replaced every 50,000 km. Coolant leaks – A leak in your cooling system can starve the engine of coolant, resulting in high operating temperatures. Leaks can occur in virtually any part of the cooling system, making them difficult to diagnose. If you suspect there is a leak, look for puddles of coolant under your car. Faulty thermostat – The thermostat opens and closes according to engine temperature in order to let coolant into your engine. Sometimes, the thermostat can become stuck shut, restricting the flow of coolant and causing the engine to overheat. Bad water pump – The water pump is responsible for keeping the coolant cycling around your engine. If it fails due to damage or a bad drive belt, or the water pump impeller is damaged your engine temperatures will rise. Bad radiator / fan – The radiator and fan are responsible for cooling down the engine coolant so that it can be recirculated into the engine. If either of these parts don’t do their job properly, hot coolant will enter the engine, having little to no cooling effect. 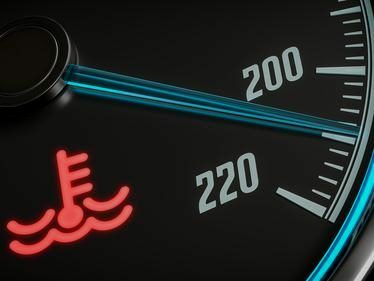 Bad engine temperature sensor – The engine temperature sensor measures how hot the engine is, giving you the reading you see on your dashboard. Although rare, a fault in the sensor can create incorrect readings and lead to a false warning. For cooling system repairs and servicing in Hamilton, contact Grimmer Motors today!